New goalie animations highlight NHL 17’s features. NHL 17 is EA Sports’ third go-around with the current generation of hardware. The first was a fan-angering stripped-down mess, while last year’s restored many features but brought little to the table. If this year’s version was a player, he’d be a solid first-line player, someone who will make the All-Star team but isn’t quite a Hall of Famer. As with most EA Sports iterations, controls are heritage-inherited from previous versions. You still have the option of playing a simple arcade style or the complex full version with all sorts of modifiers. The biggest change comes from the new net-front battles. If this sounds familiar, it’s because net-front battles were a major addition to NHL 12, then they faded away from importance. This time, the play comes from a different perspective. 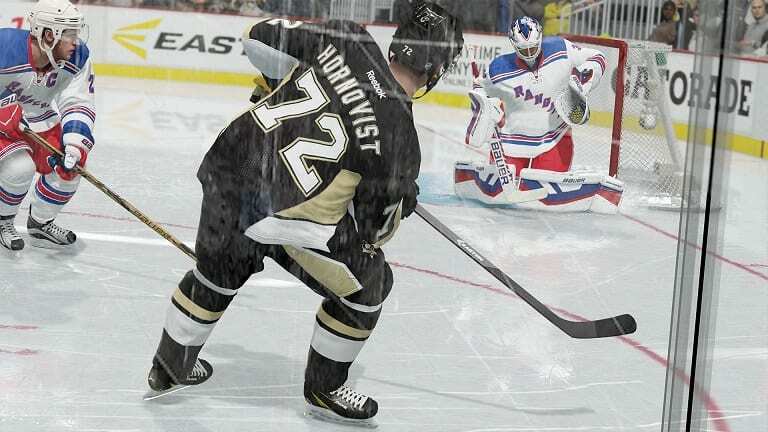 In NHL 12 it was initiated mostly by the offensive player to stand in the slot for deflections and screens. Here it’s initiated by the defenceman to tie up the player in the slot and angle/push them out. Offensive players can then spin or angle out of it to jockey for position. As with all new EA Sports features, the only issue with control tends to be remembering when and how to use it, though this activates in a specific area between the faceoff dots. There’s no fault with EA Sports’ presentation here. All it takes is a few glances at screenshots to see that the team has fully grasped the engine. It’s the usual 5-to-10 per cent graphical improvement you see with these annual iterations, but at this point, it’s really fine polishing. Of course, it’s still not 100 per cent authentic, and the “molded jerseys” thing still plagues the franchise. However, it’s shockingly realistic when you think of how far these games have come in the past decade. Crowds are livelier than ever, and with touches like full in-arena customizations and mascots (despite their awkward animations), everything feels more immersive than ever before. From the audio side, you’ve heard Doc Emrick and the NBC crew say these things before, so if you’re like us, you’ll probably be listening to music rather than the commentary after several hours with the game. General gameplay: Is it revamped? Yes, but EA claims this every year. What you’ll find is a revised AI that’s smarter about zone-by-zone play. True hockey nerds will look at things like breakouts and zone-entries, and the AI is better at adjusting to that at both sides of the puck. Goalie mechanics have been rebuilt from the ground up, with new animations reacting to both situations and shots — this goes hand in hand with the net-front battles. Shooting feels fresh because of this, and there’s an overall sense of refinement with things like catching passes, skating momentum and the types of hits thrown based on the context of rink position. All of this makes for a better but not revolutionary experience. What does help a lot is the overhaul of tutorials given in between periods, as diagrams and more specific tips help you understand the layered complexity of the game. Also, to cash in on the semi-successful World Cup of Hockey, there’s now a World Cup mode filled with branded graphics. Be a GM: EA seems to have cribbed features from Madden and the competing NBA 2K series to give full control of your franchise. That means adjusting prices, adding fan promotions, threatening relocation (or actually doing it), and upgrading/customizing the arena. Everything affects the morale of fans and players, even things like amount of national TV exposure. It’s fully possible to sim the actual game-to-game stuff and spend all of your time doing the GM simulation, as it finally feels like its own game instead of simply a tack-on playing against an algorithm. Hockey Ultimate Team (HUT): There are now more ways to earn bonuses and rewards, the chief of which is Draft Champions. This mode is a 12-round themed draft challenge (i.e., best Canadians) and your final team is used to compete either online or against the computer for HUT rewards. HUT also finally allows you to trade in those unused cards for extra rewards so you’re not stockpiling dead weight. EASHL: Online mode now adds further classes for player specifics, giving bonuses for even further types of players (Jumbo Playmaker makes us think the term was a nod to “Jumbo” Joe Thornton). Most online players will gravitate to the new levels of customization, as unlockables include insane levels of arena customization, all the way down to the stairways. Goal celebrations were highly touted as well, and they’ve come a long way from the custom celebration stuff we saw during the PS2 era of the franchise. It’s important to note that you still can’t upload your own team logo. All of these unlockables take considerable time to unlock, so completionists will have something to shoot for until next year. NHL 17 is a solid addition to the franchise that combines this generation’s graphical and AI prowess with smart steps forward into added and deeper gameplay features. Unfortunately, “great but not revolutionary” is as good as we’re going to get until we go the next step with VR.